You can configure settings which affect how some of the SnoozeIt commands work using the Options Window. This set of options controls how messages are snoozed. Mark messages as read when snoozing. Assign a category with the number of times a message has been snoozed to every snoozed message. By default, when snoozing for 2, 3, 4 days, the snooze interval is set to exactly 48, 72, 96 hours. If you prefer that the message is unsnoozed in the morning of the corresponding day, enable this option. This set of options controls how SnoozeIt notifies you about Unsnoozed messages. Mark the messages as unread when unsnoozing. Set Outlook follow up flag on the message. You can then sort your Inbox by the flag column to see all flagged messages at the top. Show this message in the To-Do list in Outlook’s Tasks pane. 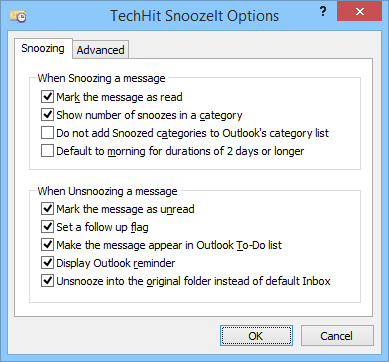 Display Outlook reminder window when a message is unsnoozed. If you click “Snooze” in the reminder window, SnoozeIt will snooze this message again for the amount of time you specify there. Enable this option to unsnooze message to the folder from which it was snoozed. By default, messages are unsnoozed into the default Inbox.